Even if you’d heard of this year’s best-performing metals, betting on them would probably have been a struggle. Ruthenium, iridium and the somewhat better-known rhodium — used mostly in specialised products like hard disks, spark plugs and autocatalysts — have trounced almost all major commodities tracked by Bloomberg. Prices are up at least 33 percent this year as demand improved for raw materials that are among the world’s rarest and collected as byproducts of mining the precious metals platinum and palladium. Unlike most other commodities, which are bought and sold on exchanges around the world, these metals are quirky assets. There are few exchange-traded funds backed by rhodium and they are small and thinly traded. 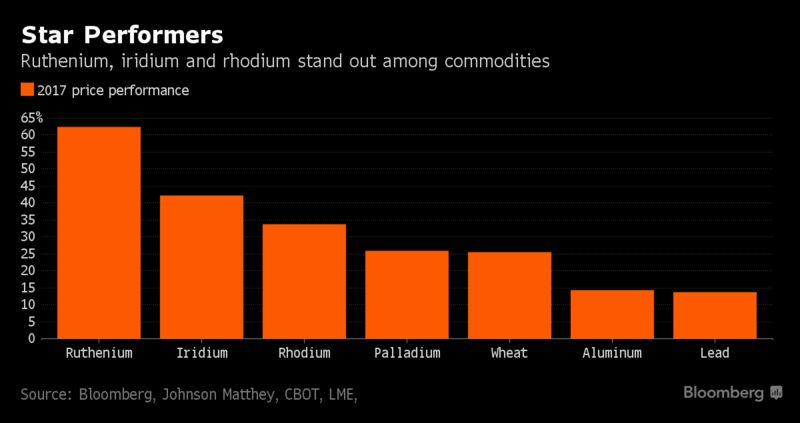 It’s even harder to buy and sell ruthenium and iridium, where most deals are between suppliers and industrial users. That leaves retail investors with a limited choice of bars or coins from a handful of dealers or getting minor exposure to the metals with shares of long-suffering platinum miners in top producer South Africa. Those wanting to buy or sell face tapping markets just a fraction the size of major raw materials, with the value of annual ruthenium demand equal to just a few hours of global gold consumption. Iridium is almost eight times rarer than gold in the Earth’s crust, according to data compiler Wolfram Alpha. Anyone who bought at the start of the year has seen the best returns among commodities. Star performer ruthenium, which is traditionally used for coating hard disks, jumped 63 percent to a two-year high amid increased demand from the chemical industry, where it’s used as a catalyst, said Peter Duncan, general manager for market research at precious-metals refiner Johnson Matthey Plc. Iridium, which is almost as corrosion-resistant as gold and mainly used in spark plugs, has benefited from higher sales of smartphones that include crystals made from the metal, Duncan said. That’s helped push prices up 44 percent to a four-year high on Friday, Johnson Matthey data show. Rhodium is near a two-year high on improving sales of cars using catalytic converters, which use the metal alongside platinum and palladium to curb harmful emissions. With demand improving, supplies of all three minor metals probably are tight, according to Johnson Matthey. Few precious-metals analysts study rhodium supply and demand, let alone make forecasts, and almost none bother with iridium and ruthenium, making it difficult for investors to get informed. Prices are also erratic. For almost three years until March, ruthenium didn’t rise for a single day, Johnson Matthey data show. Then, it surged 63 percent in just three weeks. Iridium rose or fell at least 29 percent in five of the previous seven years, and, even after a rally, rhodium is still 90 percent below a peak set in 2008. “These are not the kind of investments you encourage widows and orphans to make,” said Dawson, who is invested in ruthenium sponge, a form that looks like greyish sand. Rhodium is the easiest of the three metals to invest in. Investors held 44,055 ounces of the metal — worth $45 million at current prices — in Standard Bank Group Ltd.’s ETF as of July 4, up about 16 percent from a year earlier, according to Johann Erasmus, who oversees the fund. Deutsche Bank AG also has an ETF, but it has been closed to new investors for more than a year. Assets held by the bank total about $54 million, its website shows. By comparison, the SPDR Gold Shares holds about 26.6 million ounces of bullion valued at $32.5 billion. Gold has risen 6.3 percent in London this year. Although not open to individual investors, London-based Comdaq Metals Ltd. offers trading facilities for the three metals to producers, trade houses, banks and refineries. The tradeable benchmarks are compliant with International Organization of Securities Commissions principles, and clients have to take physical delivery, said Neil Grover, a director at the firm. In a typical month, about 4,500 ounces of rhodium, 3,500 ounces of ruthenium and 1,000 ounces of iridium may be traded via Comdaq’s system, Grover said. The limited appeal among investors means few coin and bar dealers offer rhodium, ruthenium or iridium products. One firm that does, London-based Sharps Pixley Ltd., has a “small handful” of customers looking for rhodium and other platinum-group metals, but many are probably put off by a 20 percent value-added tax, something not charged on gold items, Chief Executive Officer Ross Norman said. Even though industrial usage has jumped, supply is unlikely to rise as fast because companies like Anglo American Platinum Ltd. and Impala Platinum Holdings Ltd. produce the metals only as a small byproduct of their operations, so even rapid price gains often have a limited impact on profits. Buying South African mining stocks as a way to invest in PGMs has proved a lousy investment in the past six years, with a gauge of share prices plunging 74 percent as the industry battles low platinum prices and rising costs. Still, rhodium, iridium and ruthenium are difficult to replace in many industrial products, and new applications are possible because the metals remain appealing for their high melting points and versatility as catalysts for chemical purposes. For example, jet-engine makers got burned a decade ago when ruthenium prices surged, making it more expensive to use the metal alloys for turbine blades. But because the metal remains attractive to use in turbines due to its ability to withstand heat, there’s a potential for the industry to buy more again, said Anthony Lipmann, a trader at Lipmann Walton & Co. in Surrey, England. 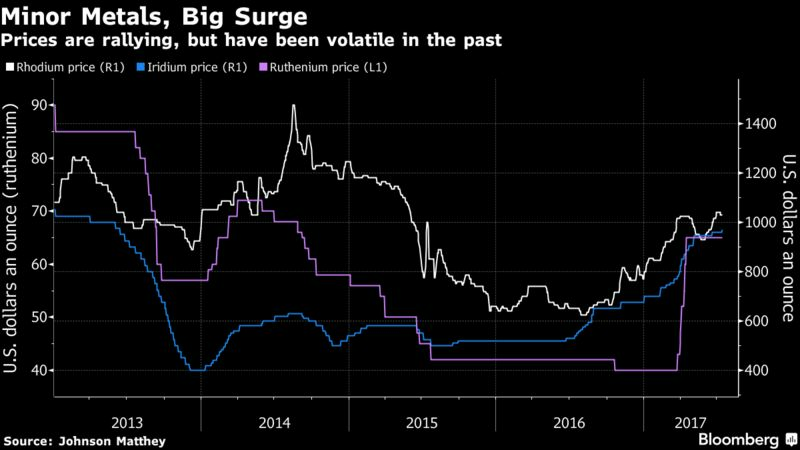 “I’m not expecting it to go up 18-fold, but it’s usable in a technically proven technology and someone will bite,” said Lipmann, who is bullish on both ruthenium and rhodium.